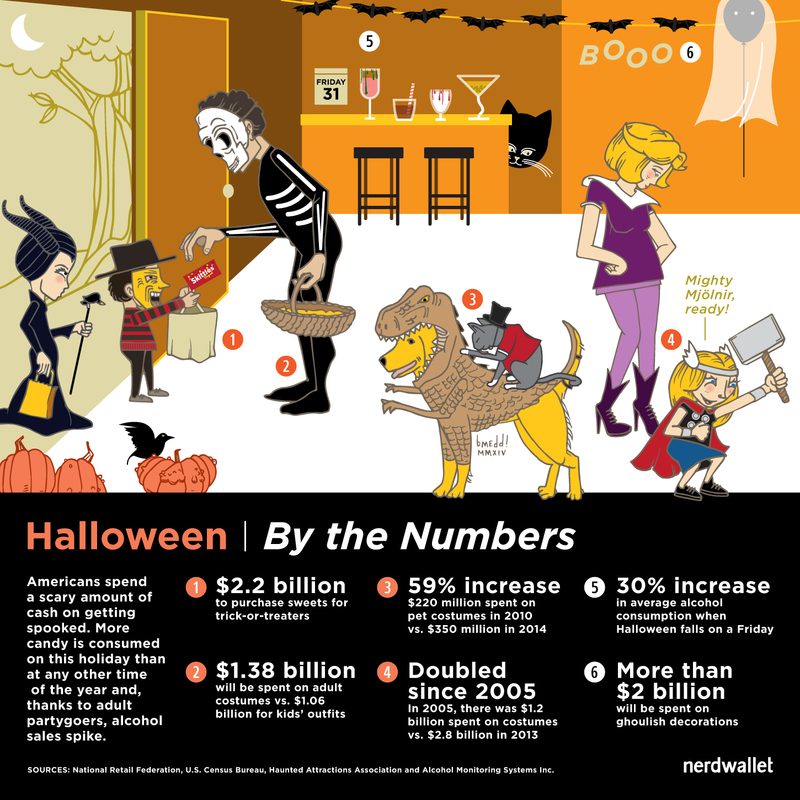 Americans will spend a scary amount on Halloween this year. Costumes, candy and decoration sales are expected to top $7.4 billion, according to the National Retail Federation. A record number of people (67%) plan to buy costumes, including $350 million on pet costumes – the fastest growing category of Halloween spending. Pet costume sales have risen 59% since 2010, according to NRF. And trick-or-treaters can expect to rake in $2.2 billion in candy. Halloween may traditionally be for children, but in recent decades the holiday has morphed into an adult affair. Bars and liquor stores can expect a burst in sales this weekend: average alcohol consumption on Halloween rises nearly 30% when it falls on a Friday or Saturday, according to Alcohol Monitoring Systems Inc.
“The fact of the matter is, it’s been taken over for the past 20 years or more as an adult holiday,” says Arthur Shapiro of AIM Shapiro & Associates, a marketing firm that specializes in the alcohol industry. Indeed, adults now spend more on costumes for themselves than on costumes for children. Adult costume sales are expected to reach $1.38 billion this year, compared to $1.06 billion for kids, according to NRF estimates. Another growing business is popup haunted houses, haunted mazes and other live-action Halloween amusements, which are expected to rake in $300 million a year, according to the Haunted Attractions Association. “People historically love to dress up and have fun and go out; people also love horror movies. Really, these attractions are another form of that,” says John Eslich, president of the Haunted Attractions Association. Eslich founded the Factory of Terror in Canton, Ohio, which is listed by the Guinness World Records as the longest walk-through horror house in the world. “People drive from three hours away” to pay the $26 per person to get a fright. “I just love to see people get scared; it’s so up-close and personal,” says Eslich, whose company operates 20 days a year and employs 120 people. Kid in lion costume image courtesy of Shutterstock.